Directed by Lasse Hallström, Salmon Fishing in the Yemen is about, well, salmon fishing in the Yemen. Coming from a director known for eccentric stories, the film sadly doesn’t move past its boring title. 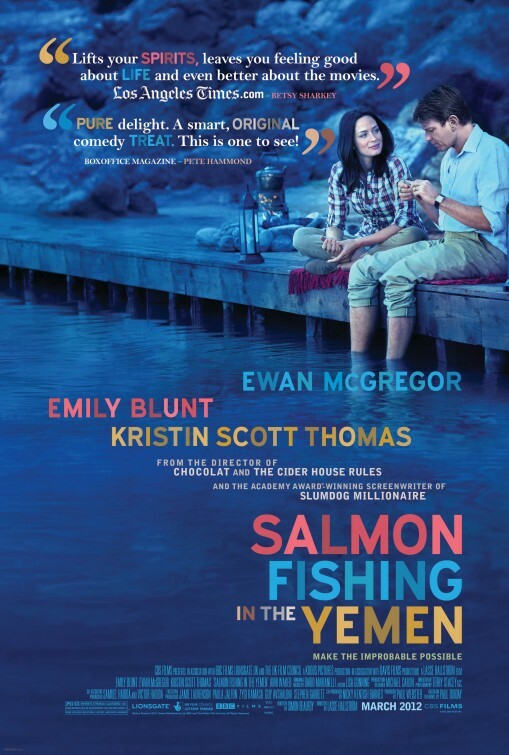 The well-intentioned romantic journey of Alfred Jones (Ewan McGregor), a Scottish scientist forced into a costly fish-relocation project, follows well the concept that salmon cannot thrive in the Yemen—it’s a neat idea lacking no originality, and deserves a nod or two for that alone. However, it regrettably drowns in its own impossibility. When Bridget Maxwell (Kristin Scott Thomas), a quick-witted and hilariously cynical press aide to the British Prime Minister, barks at her staff to find a good news story mending the waning political relationship between Britain and the Middle East, Harriet Chetwode-Talbot (Emily Blunt) receives astronomical support in funds and correspondence for the project. This ambition aims to introduce salmon in the Arabian Peninsula. She reasons, pleads, nags and eventually convinces the government fisheries bureaucrat Jones to hop on the bandwagon as he works through details of building a dam and stock yard for imported fish. Fulfilling a wildly-concocted dream of bringing food and sport to the region, the skeptical Jones eventually shares Sheik Muhammad’s (Amr Waked) honorable vision, while discovering both relief from his bland life and a fantastical new love along the way. I’ll ignore the characters’ constant vocal reminder of the weak premise—a sure signal of the film’s inability to believe itself—and focus on the film’s detrimental reliance on whimsical and disconnected story-telling. Salmon Fishing begins with comedy, focusing on the droll and empty life of Jones, and the opposing progression in Harriet’s. The strictly platonic relationship between the two provides some laughs as they take turns despising each other. But a confusing tonal shift from comedic and whimsical to unbelievably dramatic occurs, and Jones’ marriage to Ashley (Catherine Steadman), a blank workaholic with whom he shares no emotional relationship, gives way to his growing love for Harriet. She returns the gesture when her equally confusing short-relationship with the perfect military man Robert (Tom Mison) with his disappearance overseas. Herein rests a shift from a funny film to a beyond-belief portrayal of romantic feelings, coupled with a constipated strain for authentic drama. To provide a demonstration of something made funny by its attempt to be dramatic: the film climaxes at a point when— brace yourselves— Jones thwarts an assassination attempt with a perfect cast of his fishing line. Additionally, it’s worth mentioning that the two characters share chemistry far below absolute zero, to which the only response is laughter at its predictability. The only thing redeeming Salmon Fishing is an attempt at demonstrating the fleeting and disjointed relationships between people, whether as friends or lovers, soldiers and vigilantes, or political leaders and subjects, during a wartime that calls for nothing but ideological and cultural barriers. Yet even this experiment for unity gets lost beneath a torrential surface. As much as I appreciate what the film is trying so hard to accomplish, its tired use of a “swimming against all odds in unwelcoming waters” metaphor ironically applies best to an uneasy treatment of Middle Eastern descendants. For a film aiming to remove the stereotyped profile of bloodthirsty, primitive, and religiously underdeveloped terrorists—an image frighteningly common to our Western conception of such countries today—Salmon Fishing fails dramatically in negotiating cultural differences. It leans constantly on neutral racism: the friendly and hopelessly idealistic Sheik Muhammad, who alone proves the validity of my objections. The leader, whose lifestyle (besides having “too many wives to not know when a woman isn’t happy”) and linguistics assimilate well to the West, appears clean cut and presentable in a camera that frequently cowers below his annoyingly recurring mystical tales and universal epiphanies. Accompanied, of course, by overly sentimental music, our protagonists always appear transformed and moved by the foreign man, whose divine sovereignty somehow manages only to progress their “development” while neglecting his character even more than the screenplay. Opposing the miracle man is his dark and dirty, full-bearded subjects, who are unfortunately treated with a brief yet significantly unnerving travelogue of exoticism. Laughably short clichés of stone-faced, empty terrorists planning to assassinate the Sheik complement the conservatives who want nothing to do with the West’s evil/salmon. Furthermore, the poor villagers performing underdeveloped poor chores outside in their poor sand transform into the spectacle of the exotic east, completed by the goat herder. Yes, there is a goat herder, albeit only for a few seconds—because that’s what we always expect to see, right? Predictability reigns. Perhaps I’m being too harsh by not giving the fairy tale a break; but one can’t help pointing out the uneasy contradiction between the film’s objectives, literally and fictionally, and its effortless resort to Aladdin-styled controversies in the portrayal of good Westerners and evil Easterners in a foreign land. The film valiantly attempts to create an alliance between the two expectations, only to immerse in strained, cutesy, and ultimately barren connections to a reality, both on and off screen. Salmon Fishing in the Yemen opens in Philly-area theaters today. Deirdre Bullard (Dee Dee) is a junior studying cinema at the University of Pennsylvania. She is a volunteer for the Philadelphia Film Society and the Philadelphia Asian American Film Festival, and a member of Penn’s Undergraduate Media and Entertainment Club. During her free time she enjoys running, competitive taekwondo, South Park, the Simpsons, internet memes, gardening and attempting to speak German.